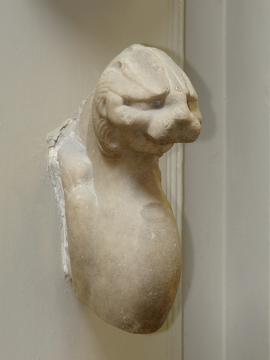 This fragment was probably part of a table support.1 The head, wings, and out-curved body of a chimera are carved from a rectangular back piece between the wings which joined the head at the back/base of the neck and carried the weight above. This style of table leg in its complete form differs from most in that the actual support for the table is not the animal head and leg but a square vertical shaft behind it, to which it is attached by means of the wings. This gives the "winged panther" the appearance of coming forward freely and gracefully while the function of joint and support is carried out by the shaft. There is an excellent, large and complete example of this rarer shaft-type of table leg in the Museum of the Excavations at Fiesole near Florence2. Half-way between this and the ordinary, freestanding animal table leg is an example in the Louvre reserve collection3 in which the lion's head, body and paw are sculptured from the full length rectangular support in a form of very high relief. 1 For the type of supporting leg intact, although patched and reworked, see H.S. Jones, A Catalogue of the Ancient Sculptures Preserved in the Municipal Collections of Rome: the Sculptures of the Palazzo dei Conservatori, 2 vols, Oxford, 1926; p. 95, Galleria, no. 32, pl. 35. 2 A. de Agostino, Fiesole: la zona archeologica e il museo, Rome, 1949, p. 59, no. 2564. 3 Louvre Inv. No. SMD424. Rome; collected in Rome by Charles Heathcote Tatham for the architect Henry Holland during the 1790s. See Cornelius Vermeule, unpublished catalogue of the Antiquities at Sir John Soane's Museum, Introduction, transcription of Tatham letters, List 1, no. 32.